Crime scene cleaners specialise in cleaning and sanitizing homes, businesses, and vehicles after homicides, suicides, industrial accidents, and other traumas while demonstrating compassion toward those receiving services. As “second responders,” our goal is to help families recover by relieving them of the burden of cleanup and return to them a home that is completely clean and sanitised. 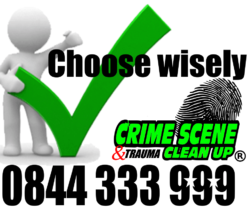 Crime scene cleanup companies do more than just clean – they completely sanitise the affected area with special cleaning agents and are able to remediate situations that typical cleaning services cannot. There are restrictions, regulations, and guidelines that all crime scene personnel must follow to ensure public health and safety. These protocols are overseen by agencies such as the Occupational Safety and Health Administration (OSHA), the National Institute of Occupational Safety and Health (NIOSH), and the Department of Transportation (DOT).